Helping other people on their spiritual journey is one of the most prominent qualities of an enlightened person. When you begin to see your interconnectedness with the rest of humanity, you will see the suffering in other people, and your compassion for them will naturally grow. One of the ways we can help others is by starting a meditation group. Spiritual support: There is a synergy that takes place when people meditate together. The healing power that is cultivated in a group meditation session is usually greater than when meditating alone. If you open your heart to others in the group, the energy of mindfulness will flow freely for everyone to enjoy. Help you stay committed to your meditation practice: Many of us have difficulty staying committed to our meditation practice. If we have a commitment to a meditation group, we will be more likely to stay committed to our own practice. Help us overcome our egos: Some of us have difficulty seeing the world beyond our personal concerns. This self-centeredness is the never-ending source of our suffering because the world will never fully comply with our wishes. Getting involved with helping other will help shift our frame of reference, and help us see how others suffer just as much as we do, if not more. Learn from each other: Teaching others how to meditate has taught me more than listening to masters talk about meditation. It has forced me to fully examine what I teach, and to communicate that teaching in a coherent manner. Camaraderie: Over time, I have developed some wonderful friendships with other members of my meditation group. A unique bond is formed when we travel together on the path to inner peace, because we are all searching for freedom from our own suffering. While starting a meditation group is easy, keeping it growing and thriving can be more of a challenge. There are a couple of pitfalls that some groups fall into. One is losing its focus, and the other is exclusivity. Most groups start out with good intentions. But if they don’t stay focused and committed to their original mission, then they lose their effectiveness. One of the reasons this happens is because there is no commitment to a specific form of meditation. Trying a different form of meditation each week is like trying a different musical instrument each week. You’ll never learn to play musical that way, so why would you expect to learn how to meditate using that approach? What I generally suggest is that you commit to one form of meditation. Otherwise, members will bring to your meetings each and every meditation that they hear about. The other thing I recommend is reading a preamble at the beginning of each session that states the mission of your meditation group. This way everyone will fully understand the purpose of your group, especially newcomers. Exclusivity is another issue to be aware of. Sometimes a group develops a few core members who become very comfortable with each other. In fact, they become so comfortable that they don’t want strangers upsetting their cozy meeting, so they become reluctant to recruit new members. Remember that the enlightened person wants to help others achieve freedom from suffering, regardless of whether they are friends or strangers. Recruiting new members should be an ongoing activity. Otherwise, the group will diminish because even the core members will eventually move on to other things as their personal circumstances change. To help you get started, and keep your meditation group thriving, we’ve developed a group starter kit, which you can download freely. The kit offers ideas and suggestions, as well as some literature you can print and share with your members. The starter kit is based on the 12 Steps of the Mindfulness Meditation Practice. For complete instruction on the 12 Steps, we recommend the book Mindfulness Meditation Made Simple as your guide. 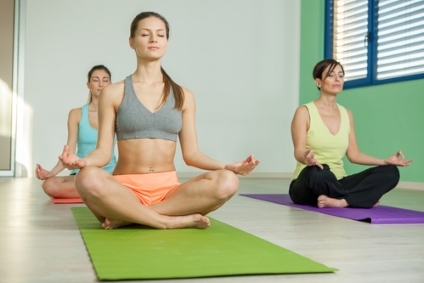 Starting a meditation group can be a rewarding experience for everyone involved. It can provide members with the spiritual nourishment vital to their development. Those who do not meditate with others regularly, in addition to meditating on their own, will find it difficult to make steady progress. Best wishes for a successful meditation group!